In the comments from ‘about me’ , Martin Newton (a UK grandmaster of safe opening tools) is angry with me. Even calling me a ‘person of questionable character’. Something that really hurts coming from a person who’s tool making abilities I admire for a long time. The problem is I can not even blame him for calling me that…. Now, to our defense, we never saw a business card with ‘John Falle’ or ‘Martin Newton’ on it. Babak received a ‘pick business-card’ from a US company called MBA at the Aloa 2007 convention in the US. And I received a similar (yet not really usable) business card from Kevin Mitnick beginning of 2007 too. The minute I heard the Toool.US crowd wanted to make a special ‘last hope’ memorabilia pickset inspired on an ‘MBA design’, I mailed MBA to ask their permission/opinion about it. There were at least three mails on this topic, and reading back my mails I can only say I really tried to do the right thing. My big mistake on the previous ‘Last Hope pickset’ posting is I did not mention MBA (and/or John Falle & Martin Newton) for the design. And that was wrong. People who visit this blog more often know I try to give credit where credit is due. And giving credit to Babak and the people who put the drawings in CAD, but forgetting to credit MBA (and/or John Falle) was plain stupid. And I sincerely want to apologize to MBA, Mr. Falle and Mr. Newton for this. Update July 16 09:30: Crawled from under the rock and found a reply to my privately mailed apology to Mr. Newton. It seems the matter is resolved now that he knows the full story. His final word were: “Thanks for understanding my point of view, no hard feelings.”. I must say I am very relieved by that! This entry was posted on Wednesday, July 16th, 2008 at 05:56 and is filed under Uncategorized. You can follow any responses to this entry through the RSS 2.0 feed. You can leave a response, or trackback from your own site. Could we see a photo comparison of these different card designs (the MBA, Mitnick and HOPE)? What I’m thinking is that there is not many ways to make a CC pick design and there has been CC sets sold for ages (at least it feels so), so I don’t really follow who is copying what. I mean, if it doesn’t have a patent on it, then why all the noise? I have designed and made the ABUS Plus picks (front tensioning) and sold them on LP101.com and now EZPicking.com and the design is like John Falles. But the gimmick is, there is not many ways to make 2-in-1 pick and I haven’t yet heard anyone complain about it. And considering the fact that these CC sets are almost like giveaways, I don’t see the problem in here…nobody is making a living out of them? Calling someone as a â€˜person of questionable characterâ€™ is totally rude and immature, considering there has been nothing illegal or even questionable happened. Just goes to show how much scrutiny all of us in the locksport community really are under day to day. Even so called “professional” security organization that seem to be tolerating us or even supporting us in some small way may in the future turn on us when they see a opportunity arise. Very sad. Kevin Mitnick sought permission from “Melvin” and modified his layout to insert more text. 2. 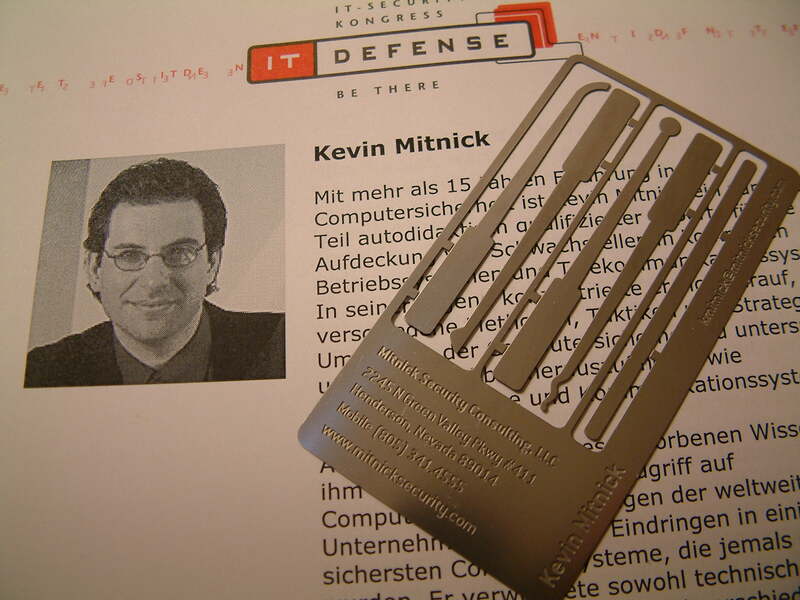 Kevin Mitnick – http://www.kevinmitnick.com/ – search for “Business Card” on this web page. Barry: I think the locksmith community, especially the old guard of master locksmiths and tool makers is still trying to figure out what this locksport thing is all about. And the fact that your tools snap out of a business card, is like Ford suing Toyota because their cars have 4 tires and an engine. As Jaakko said, sometimes there is a limited number of methods to do something, as a 2 in 1 pick or business card picks. Hopefully Mr.Newton will see that you are an important part of this community, and of unquestionably good character and moral judgment. I’d almost wear that title as a badge of honor just to cheese them off. THEN what would they do? No one patented the idea of lock picks that you could snap out of a biz-card size metal plate. Several people have done it already. It’s prior art. Esoteric? Certainly. Unique? Not a chance in hell. The simple fact that you can rattle off three other designs that have the same concept tells me that you didn’t “rip the design off” from any one person. I designed the bogota lockpick pairs, and I believe that some of the readers here know of them and use them. Im told that they appear at the Sneek party regularly. There is now a thread on the LP101 from a new picker Artkrp, asking advise on using them. One of the answers suggests that the picks are specific to particular locks. Anyone want to help. Oh and the questionable character thing, thats just a common way to piss on someone who is going to exist whether the crusty oldtimers like it or not.those old guys will not be around forever and the future belongs to the young. those guys don’t even deserve an apology. They get ideas from other people all the time and use them. Who ever heard of intellectual property that covers a business card made out of metal made as a novelty item? No one, thats who because such IP does not exist. They make some interesting tools, good for them. They also sell them for lots of money and make a nice living thank you very much. They want their cake all to themselves. Well tough luck, there is nothing wrong with competition. I would like to draw your attention to the latest redesign of safe ventures 2 in 1 safe picks. These are almost direct copies of an existing competitors design. I wonder if they got in touch with him and asked permission? I seriously doubt it. I have been a long time admire of your skills, and the work you do for locksport. I agree with the previous comments, in that for somebody to actually make a stink over something so petty, is ridiculous! Not only get mad, but question your character. But once again, you showed your TRUE character. You went out of your way to appologize, and make things right in your eyes. Most people would have just told the guy to kiss their a** ! But you proved, you are a man of great character, and a leader in this community! To everybody who replied: Thanks. Glad the matter is resolved. I had seen similar designs before. I’d only think you were in the wrong if you had made some claim of originality. > People who visit this blog more often know I try to give credit where credit is due. Yup. You try to do that a lot, which matters. No need to crawl under anything, while offering a public apology is very nice – and in character. I’m glad that the issue is solved. No offense to Safe Ventures, but you’d think these guys have something better to do than bother hobbyists. And thanks, you just gave me yet another reason to avoid MBA. Barry, you might have made soem sort of mistake there, but by questioning your character this man shows clearly: he doesn’t know you. Hi everyone. This is my first post on Barry’s fabulous forum. Could I please ask everyone to calm down and stick to the facts? Martin Newton’s concerns are perfectly understandable and well founded. Accusing professional toolsmiths of ripping off other people’s ideas is unproductive, even if it does happen (and it does). There is a lot of competition for tool designs and a very short lead time for product development. Since the market is so small, the tool has to be fielded fast before someone else gets theirs out there and undercuts you. The difference between TOOOL, LP101 etc and the professionals is just that. They are professionals – i.e they make a living out of it. So lighten up everyone and just be thankful that you (and me included!) have day jobs to go to and get to spend some spare time enjoying and toying with locks, because that is all we do in locksports. Have some respect for the people who make a living out of locks and the tools to open them. It is unwise to deliberately pi ss them off. greyman, you are right, except in this Mr. Newton case Mr. Newton himself said they have been “giving away” these CC picksets, so no loss of revenue of any sort is happening here. Glad to see this is resolved, and in a positive light! I’ve had similar misunderstandings with folks for a foolish mistake on my own part (just resolved something similar, in fact) and I know it makes you feel miserable to think you’ve offended someone you have such respect for. Usually those you respect turn out to be pretty understanding, however, and I’m glad to see it was the same in this case. You have a really impressive unique design. Credit where it’s due, but if you forget someone or don’t know those are honest mistakes. I’d actually like to get a few of these made with a different logo, would you email me about that. Entries (RSS) and Comments (RSS). 52 queries. 0.471 seconds.